Around the world, midwives support women and families during an exciting and vulnerable time of their life. Although there are general aspects of midwifery, such as the support during labour and birth, the scope of practice differs greatly between countries and regions around the globe. The education of midwives also varies, with the aim to prepare aspiring midwives successfully for their work environment. Despite this, there might be a little (or larger) gap between what students are taught and what they will be confronted with as junior midwives. 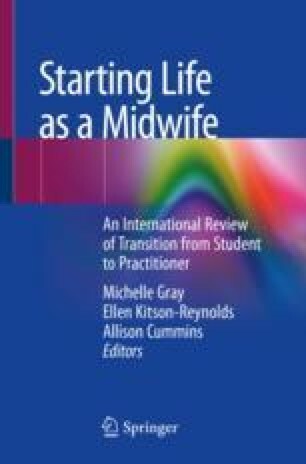 This chapter presents insights into midwifery practice and training in Germany and illustrates how junior midwives in Germany master the transition from student to midwife. The chapter will commence with some background information about Germany to provide the context to midwifery. It will then present the scope of maternity services and the variety of educational pathways which lead to registration as a midwife in Germany. At the end, one midwife illustrates her own transition process as a newly qualified midwife. Special thanks to Anne Kasper and Mike Hall for your review of content and spelling and for your detailed feedback to improve this chapter. Thank you, Annika Vondracek for willingly sharing your experience with us. Thank you so much Michelle Gray and Julia Leinweber for guiding me towards this wonderful opportunity to share insights into midwifery practice and education in Germany. It has been a pleasure to contribute this chapter.